They look absolutely gorgeous! When my kids were small I was a childminder and we always had loads of crayons – this would’ve been a brilliant project for those millions of broken ones that nobody ever wanted to use as they were too small! What a great idea. The mix of colours is lovely. Yes, I can remember having loads of little stubs of crayons left over – as always, didn’t want to throw them but too small to use. These are great and what a terrific use for broken crayons – wish I’d seen this when I was little, I could have rescued my crayon bits from the bin when my Mum thought that was all they were good for! These are really pretty. My goddaughters would love them as they are really into colouring in! Very pretty, the silicone trays are great and so easy to get the crayons out. I got some from the pound shop and they are as good as any. 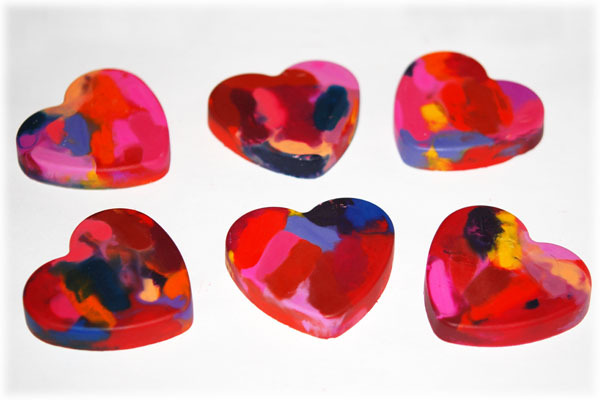 I love the colours you have used and the heart shape is lovely. What a fantastic idea. I’m going to give it a go with my niece in the school holidays. What a great idea for those stubby bits of leftover crayons… and much nicer looking!